If there is an opposite to daytime radio from the Golden Age of Radio, it would probably be Late Night Television. Daytime radio was developed to attract housewives who would have been busy doing their housework but enjoyed getting lost in the entertaining fantasy world of soap operas. Late night talk shows are closer to radio comedy variety shows, which, in turn, developed from a vaudeville format. They still appealed to housewives, but their audience broadened to include their husbands, but usually not their kids, who would have been in bed by broadcast time. Radio soaps became popular during the 1930s when a radio in every household became common. By the mid-1970s, many households had a second TV set, often in Mom and Dad's bedroom. While soaps kept Mom's mind engaged while she took care of other tasks, the late night talk show filled time when there was little else to do but to fall asleep. Some comedy, a celebrity interview, and maybe some popular music helped to disengage the brain from the troubles and trials of the rest of the day and help to put you asleep with a smile on your face. For three decades, the personality who tucked America into bed was Johnny Carson. John William Carson, born 1925, was a mid-Western boy whose Dad worked for the power company in and around Corning, Iowa, and later Norfolk, Nebraska. While playing at a friend's house at the age of 12, Johnny found a book on magic tricks and sent away for a magician's kit. Soon he was following family members around the house saying, "pick a card, any card". At 14, wearing a cape sown by his mother, he made his professional debut at a Kiwanis Club luncheon for $3 per show. "The Great Carsoni" became a regular at local fairs and functions, and after graduating from high school he hitch-hiked to Hollywood but was not able to break into showbiz at that time. During the War, Carson enlisted in the V-12 Navy College Program at Columbia University. The program allowed officer candidates to attend college courses while preparing for their commission. Carson was commissioned an Ensign and assigned to USS Pennsylvania as a communications officer. His assignments included decoding encrypted messages, and he continued to entertain his shipmates with his magic tricks and posted a 10-0 record as an amateur boxer. A high-point of Carson's military service came when Secretary of the Navy James Forrestal visited the battleship. Forrestal asked the Ensign if he would continue to serve after the War, and Carson said no, he wanted to become a magician. 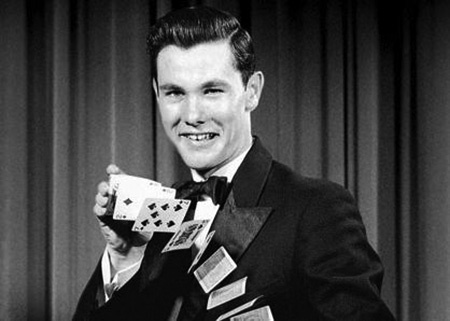 Disbelieving, Forrestal asked to see a trick, so Carson pulled a deck of cards from his uniform pocket and did one. Carson was on his way to a combat assignment aboard a troop ship when news came that Hiroshima and Nagasaki had been bombed and the War ended. After graduating from the University of Nebraska with a degree in Radio and Speech, Carson went to work for WOW Radio in Omaha and became a morning host. One of his popular routines was to interview the pigeons on the roof of the courthouse to get news about city hall corruption. The wife of one politician thought he was so funny that she helped him to get hired at a Los Angeles TV station she held stock in, KNXT. He was hired as a writer and given a low-budget comedy show, Carson's Cellar. Red Skelton was a fan of the show and hired Carson to write for his show. One day in 1954, Skelton was knocked unconscious just an hour before the live show was to air. Carson stepped in and filled in. Later, Jack Benny invited Carson to appear on his show, and Carson imitated Benny while claiming Benny was stealing his gestures. ABC hired Carson to host the day-time quiz show Who Do You Trust? from 1957 to 1962. The show allowed him to exercise his ad-lib capabilities, and after the first season, the announcer was Carson's longtime sidekick, Ed McMahon. Carson was also a panelist on To Tell the Truth. NBC had been using their Tonight Show as a compliment to their Today morning show for nearly a decade. Original host, Steve Allen had moved on to prime-time variety programs and second host Jack Paar was having trouble over censorship. Carson was hired as the new host, but he was unsure he would be able to interview celebrities for a full show. Of course, he was great at it and sat at the host's desk for three decades. The "King of Late-night Television" is a different choice to profile on an Old Time Radio site, but many of Johnny's guests were major players in the radio industry. 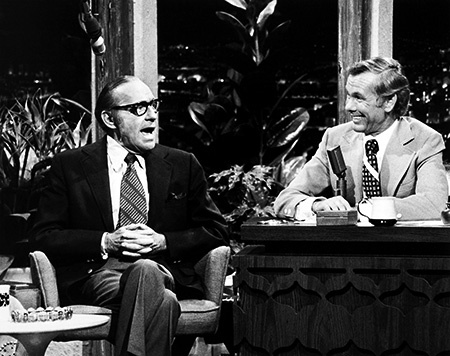 To demonstrate what Radio was like, Johnny had guest Bud Collyer help to set up a simulated broadcast of Superman in 1969 (Johnny played Jimmy Olsen) In September 1974, Mel Blanc and Jack Benny were guests. Jack Webb shows up to do a send-up of Dragnet, and Groucho shares some memories as well. I buy mp3s from otrcat. very inexpensive, great quality, and an entire series is usually available. That way I can play any show or entire series I like!